Debian User Forums • View topic - How I get grouped/linked several documents? How I get grouped/linked several documents? I have several concept documents, I'd like to keep linked among them, so I can keep joined the whole brain concepts throught several documents apart. I create several office documents named different, but all of them need to be linked in someway (I dont know how) so I can keep trace of the whole concept accesing any of the documents of the group by separate.. I also would like to be able to unlink a document from the group by removing the "hyperlink" from any of the documents. I 'd like to create cross hyperlinks, so If I create a hyperlink pointing to one file, in the other file It appears its counterpart file, And when I remove the cross hyperlink, It dissapears in both files or more. I really dont know how to do to recreate a system that work with documents in this way, its something similar to work with documents and tags (like picassa but with documents).. do we have any document manager that works with tags (concepts)? Im creating a lot of concept documents , that need to be indexed in some way so I cant miss documents that are similar by related concepts, I also would like to be able to open any of them from each other of the linked group. Re: How I get grouped/linked several documents? ok, I think I was looking for an easy to deploy and simple to use DMS(Document Management System Software). Most people probably just use file system an put similar documents into folders, although this has limitations (file cannot be in many folders, for example). Or you can use git repos, so that each collection is it's own repo. Not entirely sure what you want, but I know that gnome-documents. for example, can create collections of documents, so you can link or unlink documents to a group. 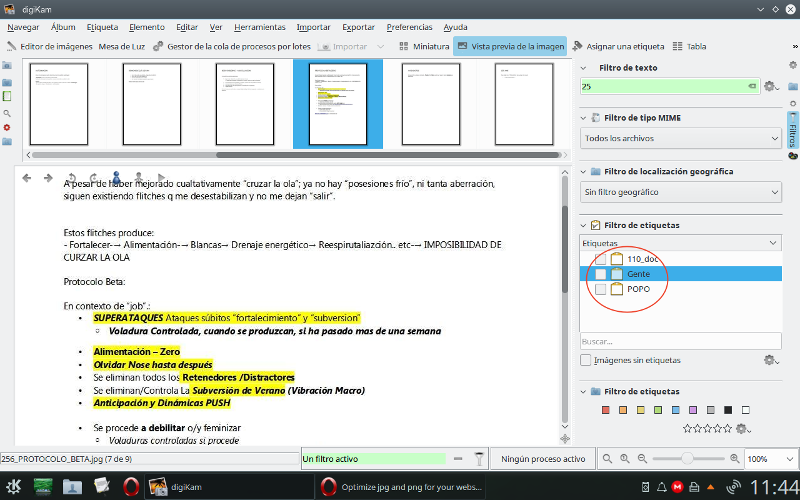 It also allows you to book mark documents and write comments into them with evince. Then there is Paperworks, which allows you to label documents and keep them file them efficiently (make groups and whatever). It even learns, so that it can do it automatically after you have done it a few times. But it is more for "real papers", that is meant to be used with a scanner to ocr and manage paper that you get in the mail and so on into digital searchable format. pylkko wrote: Most people probably just use file system an put similar documents into folders, although this has limitations (file cannot be in many folders, for example). Or you can use git repos, so that each collection is it's own repo. I think i will use digikam and tags (im happy how this worked) to keep track of all documents and groups..Ive created a script that open libreoffice within digikam and update image exported document if updated libreoffice odt file. All documents and converted image documents are in the same folder, I just need to get an easy way to linked/unlinked them and know what relation is among them. the script to convert libreoffice to jpg and update them when file changes. I use it and like it very much. You can't believe your eyes if your imagination is out of focus. I will use Digikam.. thanks.